Just what was the SE&CR Centenary and why was the Bluebell Railway celebrating it? In answer to the second part of the question, the Bluebell Railway has the largest collection of ex-SE&CR locomotives, carriages and wagons that exist and can put on a display second to none. The events we hosted are listed below. Last century, a multiplicity of railway lines operated by many different companies sprang up. Two of these companies were the South Eastern Railway - dating back to 1841 - and the London Chatham & Dover Railway - dating from 1854 - both of which connected Kent and East Surrey with the capital. Many of the services ran in direct competition with one another. So the directors of the two companies sought a way of making better use of their existing lines and reducing the costs of running them. They came up with the idea of a Managing Committee which ran the operating side of the two railways - although the two companies retained their legal identities until the grouping of 1923. The new arrangement, known as the South Eastern & Chatham Railway, was put into effect from 1st January 1899, but strangely was not formalised by Act of Parliament until 5th August 1899. This is why our main celebrations will take place over the weekend of 7th and 8th August 1999. This engine was built in 1902 and is the only surviving engine to have been built at Longhedge works, and the only survivor of its class, being saved by the Wainwright 'C' Class Preservation Society. It was built under the direction of Harry Wainwright but the design is that of R.R.Surtees. It is painted in the elaborate goods livery of the time of its building. 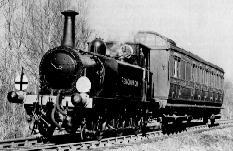 This locomotive, also a Wainwright design, was built at Ashford works in May 1905. 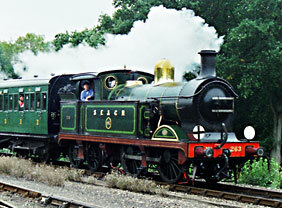 Used on suburban duties in south east London and later on rural lines in Kent and Sussex, she was withdrawn in 1964. Saved from scrap by the 'H' Class Trust she came to the Bluebell from Ashford Steam Centre in 1976, and is currently on static display, awaiting overhaul. 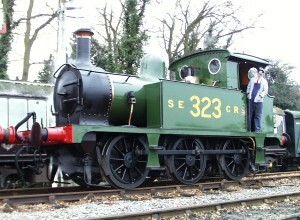 Usually seen in unique 'Bluebell' Blue livery, No.323 has been painted in the short-lived World War One livery which was soon replaced by the final SE&CR livery of grey. Built as one of a batch of eight in 1909-10 for light passenger duties, she came to the Bluebell in 1960 as our second engine. Steamed in 1999 for the first time in over twenty years, this locomotive was rescued from scrap by a private owner in 1964. She was built in 1896 to the design of James Stirling and was rebuilt by Wainwright in 1908 when the boiler and cab were replaced. It has been restored to the ornate goods livery of that period. 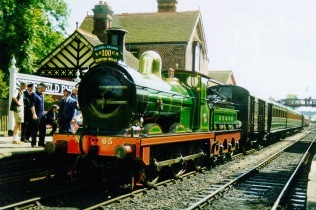 Three other 'P' Class tanks survive, 27 and 178 are also on the Bluebell Railway, and 1556 is on the Kent and East Sussex Railway. The graceful 'D' Class 4-4-0 express locomotive No.737 is part of the National Railway Museum's collection. Within our stock of over 100 carriages and wagons, we have 5 coaches from the SE&CR. 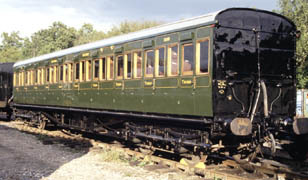 Three of these are the well known 'Birdcage' brakes which have a guard's lookout on the roof, one 1st & 3rd class composite and a 10 compartment 3rd class carriage, which, along with a coach of the same design built by the Southern Railway, regularly forms our Vintage Branch Line train. The two 10 compartment coaches are known as 'hundred seaters', as at a push 10 people can be seated in each compartment. Today they are restored to the Southern Railway 1930s livery, and despite being nearly 80 years young they are reliable and very popular with both visitors and film companies alike. 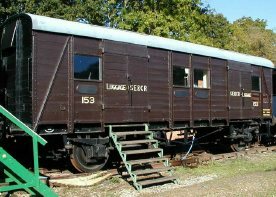 SE&CR Passenger Luggage Van No.153 was built in 1922, and was repainted and made operational to enable it to take part in the centenary events. In addition we have some stock from the London Chatham and Dover Railway, one of the constituents of the SE&CR. In particular restoration work is under way on a 4-wheeled LCDR brake second dating from 1889. Our vintage Chatham goods train operated at various times during the year, and was made up of a number of pre-grouping wagons dating from 1914-1922, most of which are of SE&CR origin. This included one wagon, re-entering service on the centenary weekend, which had just received a most comprehensive re-build. This special Pullman featured the debut of recently restored locomotive No.65, built in 1896. The menu was especially prepared with a continental theme. hauled by the newly restored O1 locomotive No.65. There was also a static display of SE&CR rolling stock at Horsted Keynes (with the chance to examine the inside of the Guard's "Birdcage" of an SE&CR brake coach), as well as an exhibition of original paintings of SE&CR subjects, a display of SE&CR artefacts and memorabilia, and two SE&CR model railways. Three Pullman coaches from the 1920s and '30s were added to this set on the Sunday. Three coach set of SE&CR and LB&SCR coaches (1900s-1920s) (Olive Green) with SECR Luggage van, and SR Passenger brake van.